This is a great example of how quickly a car crash repair company can get funding against their invoices. We were contacted at 4:30pm by a car crash repair company that had an invoice for £4,000 that they wanted to receive funding against. The way that this type of car repairer finance works is that they receive 100% of that invoice value, less a fee for the transaction. 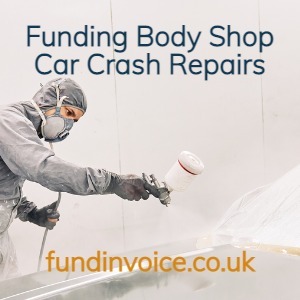 The actual enquiry was received near to close of business, so overnight we introduced the company to a specialist funder that deal with car bodyshop crash repair invoices that are made out to car insurance companies. By 10:30am the following morning, we had heard from the specialist funder, confirming that they had sanctioned the deal, sent documents to the car repairer, and were expecting to pay out funds the following day - that will be day 3 of the process. If you want to know more about how funding against insurance company car repair invoices works, and the costs that are likely to be involved, there is information on our website. This is a very quick turnaround for any kind of business financing. End to end, it could be three days between initial contact and money being received by the repairer. This is in stark contrast to the normal payment terms that you might expect to experience, if you are undertaking repairs that are paid for by insurance companies. Typically, you may be waiting for 60 days, or even more, before you receive those payments. This can create cash flow pressures when you have to purchase parts for the repair, pay your staff and cover your regular business overheads. There is no further obligation on the repairer to use the service again. However, the majority of the repairers, that set up one of these facilities, tend to regularly rely on the funding that they can then access against repair invoices as they are raised. I was speaking to the salesperson from this particular specialist funder the other day and she told me that the majority of their clients find this style of financing so simple to use that they regularly use it, on a repeat basis. The financier does not take a debenture over the company and there are no personal guarantees involved. The client only has to provide a warranty that they will not produce fraudulent invoices – which should not be a problem for any legitimate company. If you need help please call Sean on 03330 113622 if you are looking to get funding against car repair invoices quickly.